C = concentration of CO2 in the soil gas z = depth in soil $(z) = production rate of respiratory CO2 D = diffusion coefficient for gaseous CO2. where Ca is CO2 concentration in air, and z* is characteristic CO2 production depth where 3C/3z approaches 0.
where S(z) = [«(0)z*2/D] [1 - exp(-z/z*)], 8 = 813C%, and the subscripts s, and a refer to soil, respired, and atmospheric CO2, respectively. To solve for Ca, the paleosol 813C method is forced to make several assumptions, the most important of which concerns the value of S(z), which can be considered as the mean concentration of CO2 added to the soil via respiration. The value of S(z) can be estimated by looking at total concentrations of CO2 in modern CaCO3-containing soils. Pedogenic carbonates only form under rather dry climates with less than 80 cm of mean annual precipitation (Royer, 1999), and such soils have S(z) concentrations ranging from 3000 to 10000 ppm (Royer et al., 2001). It is this range of ignorance that provides the major portion of error attached to reported results using this method. Other possible errors include failure to estimate the proper temperature at the time of formation of the paleosol (which affects the isotopic fractionation between CO2 and CaCO 3) and changes in the values of fractionations shown in equations (5.13) and (5.14). In many paleosols the value of 813C for organic matter is not measured, and 8^ has to be calculated from 8oc via both equations (5.13) and (5.14). Another more serious problem is that the carbonate analyzed must be true pedogenic carbonate and not derived from di-agenetic recrystallization, especially of marine carbonates. Thus, the method requires field experience in studying and identifying paleosols (e.g., see Retallack, 1990). A variant of the paleosol pedogenic carbonate method has been adapted by Yapp and Poths (1992, 1996). They measure the 813C value of trace amounts of carbon included within the structure of the mineral goethite (HFeO2). 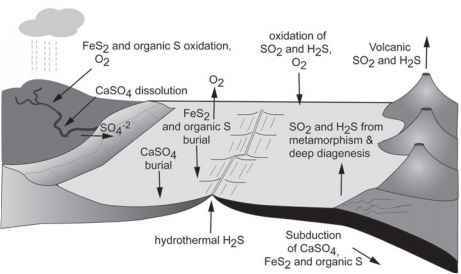 The reasoning behind calculating concentrations of atmospheric CO2 is the same as in the carbonate method, except that the concentration of carbon contained within the iron oxide is used as a direct measure of soil CO2 partial pressure. 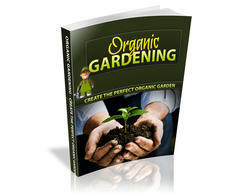 In this way the necessary assumption of a wide range of values for soil CO2 can be avoided. However, organic matter is rarely present in pedogenic goethites, and esti mates of 813C of the organic matter from an extrapolation procedure leads to the considerable error with this method. A more important problem is the rarity of appropriate unaltered soil goethite, as compared to soil CaCO3. Results for paleosol estimates of atmospheric CO2 are shown in figure 5.16 and compared to the standard (best estimate) curve from the GEOCARB III model for the entire Phanerozoic. The solid line represents a five-point running average (Royer et al., 2001a) based on hundreds of analyses of Carboniferous to recent paleosols (Cerling, 1991; Sinha and Stott, 1994; Andrews et al., 1995; Ekart et al.,1999, Lee, 1999; Lee and Hisada, 1999; Ghosh et al., 2001). Also included are determinations by Mora et al. (1996) and Yapp and Poths (1992, 1996) for Devonian and earlier paleosols. In general there is qualitative to semiquantitative agreement between the theoretical GEOCARB modeling and the paleosol CO2 estimates, with high values during the early Paleozoic (before 380 Ma), a large drop during the Devonian and Carboniferous (380-320 Ma), a rise to high values in the Mesozoic (250-65 Ma), and a gradual overall decline during the Cretaceous and Cenozoic (140-0 Ma). The very high palesol values during the mid-Mesozoic around 180 Ma are biased by two extremely high (RCO2 = 20) Jurassic values of Yapp and Poths (1992, 1996), and I believe these values are excessive. Figure 5.16. 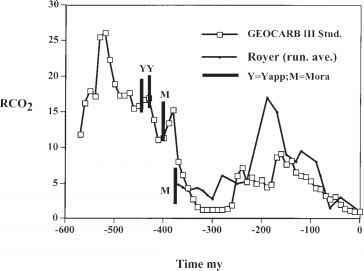 Comparison of RCO2 determined by the paleosol carbon isotope method to GEOCARB III modeling. Y= Yapp and Poths (1992, 1996); Mora = Mora et al. (1996); Royer = running 5-point average of all post-Devonian paleosol results summarized by Royer et al. (2001a) from a variety of studies (see text). Because of special interest in the rise of large vascular land plants during the Devonian and their effect on atmospheric CO2, an expanded plot is shown for this time period (figure 5.17). Data for paleosols are from Yapp and Poths (1992, 1996), Mora et al. (l996), Mora and Driese (1999), and Cox et al. (2001). Also shown are paleo-CO2 estimates via the stomatal index method (McElwain and Chaloner, 1995, 1996; discussed next). Both the two kinds of proxies and the GEOCARB modeling show excellent agreement, and this further emphasizes the importance of the rise of large vascular land plants during the Devonian (380-350 Ma) as a major effect on atmospheric CO2. How do you determine paleosol? How do paleosol carbonates form?